Need a lift but you don't want to pay for a taxi? Now you can have the best of both worlds. Download the "Lyft" app and request a ride. Enter the DISCOUNT CODE, "SUE99535" into the payment section and we'll pay the first $25 for your ride. Universal Studios Hollywood is also included when you buy the 3-day Pass that gets you in to 37 attractions in Southern California. 3-day round trip by bus from Los Angeles to Las Vegas and the Grand Canyon plus 2 nights at a Las Vegas hotel...All for just $109 per person! Travel by luxury bus from Los Angeles to Las Vegas for ONLY $1?! 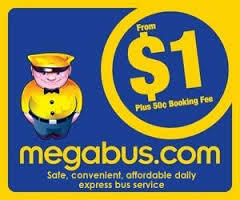 ​Welcome to Megabus, my friend. Travel in comfort and style. All you have to do is buy your ticket more than 30 days in advance.